2010 AirVenture - Oshkosh is just around the corner. For the cost of admission to the event, please look at the admission page - http://www.airventure.org/planning/admission.html Daily tickets are $25, a ticket for the week is $110. Spouse daily ticket is $21, weekly ticket is $75 . 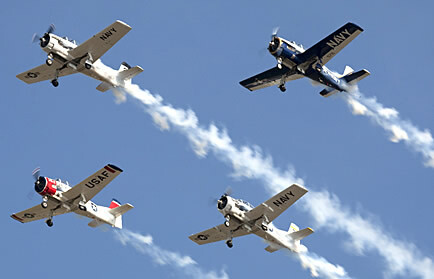 If you buy online by June 15, you can save a little extra http://www.airventure.org/planning/advance_member.html . We will meet in Darien, Wisconsin, about 125 miles from the show, on Friday or Saturday (July 24). Bob will host a “play day” and evening cookout at his ranch on Saturday - fishing, golf, plane rides, etc. We will caravan in together on Sunday. You are welcome to come later or leave early. Please let us know by June 10 if you are planning to attend. Bob must let EAA know how many spots to reserve for us. You must be a member of EAA to camp at AirVenture. EAA membership is $40 a year and that includes Sport Aviation magazine and free admission to the EAA museum. To join, go to: https://secure.eaa.org/eaajoin/securejoin.html You may also join on arrival at AirVenture. If you plan to park with us at Oshkosh, please let us know by email or phone byJune 10.